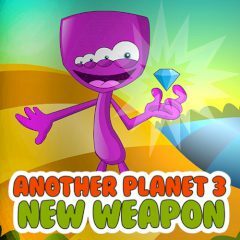 This time you will have to explore this strange planet and just help this cute alien and use the weapon. Well, there is no time to explain and you should do everything to stay alive and pass each stage easily. So, everything depends on you now. Well, you are here again and this cute alien is back to another planet to find new weapons. Could you believe that? So, the main things is not to waste your time and set the best record here. Are you ready? Then go ahead! So, as you have already understood, your goal is to help him do it. This is the third part of an exciting game, where you can use all your skills and other thinking abilities. That is why, if you are ready for that, then do not waste your precious time and start it right now. Enjoy the game.